For some, Christmas is about getting. For others though, it's wholly about giving. I don't think either action weighs above the other. After all, you can't give without someone getting! Sometimes it takes a little humility in accepting charity. Of all the Christmas times that have come and gone, one still stands out in its own special way for me. It was the year all of my gifts came from people I had never met before. I don't remember the year. I do remember a guy playing saxophone was in office and never seeing an episode of Arsenio Hall due to my blasted bedtime. Despite my dad working as a journeyman roofer and making approximately 87 rupees a day, him and my mother managed to put a down payment on a house. The place had potential, but was a real shanty that would have made the orneriest Hooverviller blush. My mom was a stay at home parent who looked after us and my dad actually walked to work each day and would pick up aluminum cans on his way back. After doing this for several years we had such a collection we had to rent a truck to take them to the recycle center, but that's a tale for a different day. Most of our clothes were purchased second hand from thrift stores and my toys resembled insurance liabilities rather than child playthings. It didn't bother me or my brother at all though. We were kids with grass stains on our knees and dirt (or sap, depends on the day) in our hair. We were used to getting by with less, we didn't know there was anything else. At Christmas time though, I always felt that uneasy feeling. All of the kids at school would ramble on about what they were getting for Christmas. A new bike, the latest GI Joe, a Lego set, you name it. Commercials would explode out of the TV set emphasizing how lame we were, but how cool we could be with the latest Reeboks. Once my newfound inadequacies were so blatantly laid out before me, I did what any rationally thinking kid would do. I begged my parents for loot! Specifically I wanted a bike, a wrist watch and a VHS copy of North. The fact that I didn't know how to ride a bike, had no time related responsibilities and wanted a VHS copy of North played little into my decisions. My brother wanted a bike as well, plus a Barney. I wanted a Barney too, but at the ripe age of 7 I was already pushing the socially acceptable norms by wearing Batman underwear, but I digress. My father retired years ago, but the smell of tar still reminds me of him. Does that look healthy or what? With the mortgage and my mom not working, all of the financial burdens lay on my father. He is and always has been a hustler. He'd have garage sales, recycle cans and whatever else he could do to support us. He was a roofer and of course Christmas is during the winter, and since you can't generally work on a roof in inclement weather, he was off a lot which just compounded the X-Mas blues. When it was pretty apparent I'd be lucky enough getting a stocking, let alone a present, my mom found out about this cool program being run by our church. There was this large Christmas tree and you could fill out a card with your name on it and your Christmas list of gifts. Then some generous benefactor could take your card and buy you gifts. Even though the prospect of this titillated my senses, I knew better than to go nutzoid on the list. So while my brother was jotting down game consoles and exotic animals, I simply wanted a bicycle and a wrist watch. Now that kid is feeling the Christmas mood, or a mild stroke. This was pretty much an unprecedented event, unrivaled in scope since Hulk Hogan body slammed Andre the Giant. Usually if a family got picked, the benefactors would just unanimously leave the gifts at Church. But we were going to dinner! I was really nervous, my mom wasn't going and it was just my dad, brother and yours ghoolie. Once it hit everyone that there would be some gifts under the tree this year we realized we needed a tree! We ran down to one of the many tree lots that sprouted up over town like leprosy. My dad went to the smallest lot in town in the less traveled area. A dim light from a badly rusted RV trailer illuminated the sparse lot. Pops haggled about the price with the proprietor and before you could belch Jingle Bells, we were on our way to the mystery family's house with a 7ft Canaan Fir strapped to the roof of our '78 Cutlass. I actually saw a tree lot with a old beat up trailer in the back recently, its so nostalgic it hurts. As we made our way across town I euphorically gazed out the window at the passing houses magically lit up. I thought about these people whom I had never met, and how they were going to make my Christmas dreams come true. Only the sudden lurch from my dad's downshifting snapped me out of my fantasies and I looked out the window and saw the house...or should I say winter flipping wonderland. The entire lawn lit up, it was almost hard to look at. Neatly groomed trees, netted with lights and flickering adorned the yard. Santa's sleigh was on the roof and the Reindeer lit up, suspended in mid air to take flight. We walked up to the door and my dad knocked. Looks great, but you could probably put a down payment on a BMW with the electrical bill. When the door opened a middle aged man, a little older than my father opened the door. Clean cut and with the kind of smile that immediately puts you at ease. Except my brother and I were about as shy as could be and walked just behind my dad as we stepped inside. The warm air smelled of gingerbread and chimney smoke and I could hear seasonal music playing in the background. There was a smorgasbord of food on the table, but again, my brother and I were shy kids and I think I took a bread roll to be polite. The man seemed to sense our nervousness and took us upstairs to meet his beautiful, gorgeous, mesmerizing, enchanting daughters. One seemed about my age and the other a few years older. They greeted my brother and I with smiles that seared into my memory banks. They had Candyland set up and we played a few games. I was too lost into staring at the girls' beautiful blonde hair to form a strategic game plan and gushed as they rolled dice and laughed. They really did have a feast laid before us, even the fruit cake looked palatable. After a bit, the dad noticed my brother and I coming around, and decided it was time to show us the gifts. We were led to the garage where 2 glorious Huffy bikes sat side by side. I tentatively walked over, afraid to believe it was real. I got on and grasped the handles, ready to wake up from this dream at any moment. It was real though. The Huffy lettering sparkled and the kickstand was chrome. The dad again sensed the right moment and let my dad know we could leave. They also gave me a watch and an awesome picture which I still have to this day. After that we profusely offered our thanks and left the magical Christmas kingdom with riches, tales of beauty and a newfound joy in Christmas. No shooting one's eye out with this! That fateful evening was 22 years ago. Sadly I have no way of finding out who those people were. I like to just keep them in my memory. The all knowing father, the gorgeous daughters, the magnificent house and delectable food will remain frozen in time like a snow globe. Being an adult now (well, trying to) I've come to realize the truth that there is more in giving than in receiving. I've since participated in the very same program that made my X-Mas special. If your area has something similar, I highly suggest giving it a shot. Thanks for reading, and although it's been said many times, many ways, a very Merry Christmas to you. That's awesome. She'll have fun picking out the gift. I just read your story to my daughters, and my oldest wants to check to see if our church has a program like that. Ad anyone that orders a Goodie Pack this year here on RetroDaze will find a hand crafted wooden Christmas ornament in them from our shop. @vkimo: You'll get to see his work up close if you order a Christmas Goodie Pack. Thank you for sharing the holiday joy with such a great story about the kindness of others! I always look forward to your articles vkimo! @mickyarber - Thanks for the kind words! I just read your piece and equally enjoyed it. You mentioned you make wood crafts, do you have a website where you sell them? I think this may be my favorite story I've read here on Retro-Daze. I read it while Away in a Manger was just playing in the background, it it came darn close to bringing a tear to my eye. That or it's from all the saw dust in my shop today. Just an excellent read. I think I'll be reading it to my daughters along with The Night Before Christmas this year. Yeah that one hits right in the childhood. Angel trees were always anonymous here as well. Never heard of the benefactor giving the stuff personally. That truly is awesome! Thanks, man. I dig it. I can totally see looking at that thing for hours. @fuschnikt Here you go, its a painting by Jaro Hess in the 30s I believe. 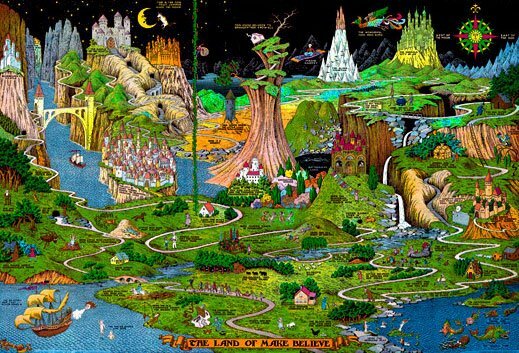 Its a map of the fairytale kingdoms. So much going on in it and I would look at it for long strands of time just taking it all in. Love this. I can relate to hand-me-down toys and Goodwill clothes. My parents saved money wherever they could. Now-a-days, our church does the giving tree thing, too. Every year my family grabs two, a boy and a girl. At our church it is pretty anonymous, so inviting anybody to dinner would be out of the question. Sometimes I wonder what the reaction would be to the gifts we put together. Mostly, though, I'm just happy to be giving. I'd love to see this awesome picture you mention sometime. Great memory to share V. Thanks for that. It warms the heart! We do indeed make sure to take part on "Angel" Tree giving during this season. Sometimes it's as simple as a tag on one at the local grocer. Other times, it's church that is handling the exchange. Never have I heard of actually inviting the recipient to dinner at home. That is extremely generous, and that individual is truly a kind soul. I hope that one day you're able to find that family, and offer thanks to them.